Request “Getcha’ Some” at Your Local Radio Station! So we turn on our local station in Dallas yesterday, K104FM, and to our surprise they were debuting Big Sean’s “Getcha Some”! What a rewarding experience it was because we here at WEKNOWBIGSEAN have been starting grassroots Big Sean movements in both Dallas and Austin, and hearing a predominately Southern Hip Hop station play Big Sean really was a dream come true. This got us to thinking… if a handful of people can get a large radio station playing GOOD MUSIC why can’t other people in every other city, no matter how big or small, do it as well? So, everyone PLEASE CALL UP your local radio station and request Big Sean’s single “Getcha Some” and let’s help spread the word! It only takes a couple minutes, but if we all work together we can really make a HUGE difference! New track from dope newcomer XV featuring Big Sean. This track is off of XV’s latest mixtape, Everybody’s Nobody, which drops tomorrow. Check that out HERE! Gotta love another partnership between Hip Hop & alcohol (See: Armadale & Ciroc). Recently, Grey Goose & Complex Magazine have come together for a new promotional feature called Rising Icons. It is a showcase for rising musicians of different regions within the U.S., with the fans voting for who is featured from what area. Some other artists that have been receiving votes include Kid CuDi & Wale, and also in that mix right now is D-town’s very own Big Sean. 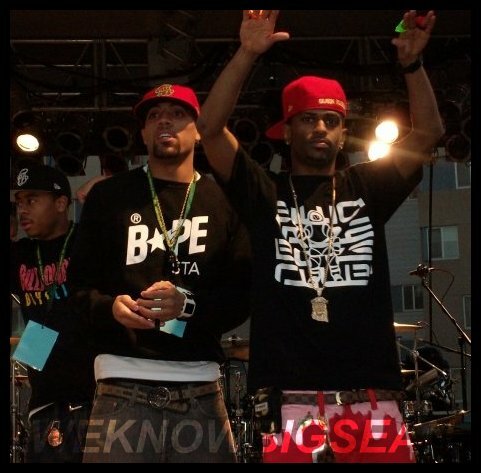 Click here and continue to vote for Big Sean, so he can be featured on the front page of this contest. Let’s go yall! Big Sean is the newest artist signed to G.O.O.D. Music/Island Def Jam. Born Sean Anderson, in Santa Monica, CA, Big Sean relocated to the west side of Detroit, MI as an infant, where he was raised by his mother and grandparents who worked steadfastly to instill in him the principles of hard work and determination. As a teen, Sean grew his local fan base by honing his rhyming skills weekly at 102.7FM, a local Detroit radio station. It was there that he had his first big break. In 2005, the aspiring rapper stopped Kanye West in the radio parking lot as he was leaving the station, and was asked to spit 16 bars for the rap legend – 80 bars later he handed Kanye the home burned copy of his CD and kept in touch for months, sending several tracks to his idol for critique. After months of submitting songs and meetings, Sean finally got the call from Mr. West himself offering to sign him to G.O.O.D. Music. Officially signed to G.O.O.D. Music in 2007 and then to Island Def Jam in 2008, his two highly circulated mixtapes, “Finally Famous–The Mixtape” [Nov. 2007] and “U Know Big Sean–Finally Famous Vol. 2” [Nov. 2008], put Sean on the map as a rising talent. However, it was his hit single “Getcha Some” on Kanye West’s “Can’t Tell Me Nothin’ Mixtape” that took over the airwaves, creating major buzz for the artist and quickly solidifying him as a breakout star. His debut album entitled “Finally Famous” set to launch this summer features Hip Hop all-stars such as ten-time Grammy Award-winning artist Kanye West, hip hop Renaissance man Pharrell Williams, AMA’s breakthrough artist of the year The Dream, and many more. New version of Big Sean’s “Rollin’ (Remix)” this time featuring fellow FF member Say It Ain’t Tone. Ladies and gentlemen, it’s finally HERE! Big Sean’s first music video, history in the making. Enjoy!